It is my great pleasure, as the chairman of FIG Working Group 6.1 (Deformation Measurements), to introduce to the members of FIG this final report of the ad hoc Committee on Terminology and Classification of Deformation Models. I would like to thank Dr. Walter Welsch and Dr. Otto Heunecke for undertaking the difficult task of summarizing the results of 8 years of research and discussions (sometimes heated) on the subject within the activity of WG 6.1. The need for the special study of the classification and terminology used in deformation modeling was recognized at the 6th International Symposium organized by the FIG WG 6.1 (formerly known as WG6C) in Hanover, Germany, in 1992. The need arose as a result of the growing interest in the interdisciplinary approach to physical interpretation and modeling of the relationship between causative factors (loads) and deformation. Though basics of the load-deformation analysis are well known in applied physics and mechanics of deformable bodies, geodetic engineers have entered the discipline only recently. At the symposium in Hanover, some authors became confused with the use of the terms such as dynamic or kinematic models of deformation, deterministic vs. statistical, or parametric vs. non-parametric modeling, etc. Though this final report may not satisfy all specialists in deformation modeling, who may be coming from various fields of science and engineering, it gives geodetic engineers a solid basis for a unification of terms used in deformation modeling. Certainly, there will be still more discussion on the subject but the background gained from this report will help geodetic engineers to better understand the finesses of the modeling processes. This report represents one of the latest involvements of Working Group 6.1.The group has always been one of the most vital groups of FIG Commission 6 and one of the most active international groups dealing with the problems of monitoring and analysis of deformation surveys in engineering and geoscience projects. Although the accuracy and sensitivity criteria for determining deformations may considerably differ between various applications, the basic principles of the design of monitoring schemes and their analysis remain the same. Due to the constantly growing technological progress in all fields of engineering and, connected with it, the increasing demand for higher accuracy, efficiency, and sophistication of the deformation measurements, geodetic engineers have to continuously search for new monitoring techniques and have to refine their methods of deformation analysis. Working Group 6.1 has played a very important role in providing a forum for the exchange of information in the new developments by organising ad hoc study groups, technical sessions during the FIG Congresses and, more important, by organising specialised international symposia on deformation surveys. These have occurred in 1975 in Krakow, Poland, in 1978 in Bonn, Germany, in 1982 in Budapest, Hungary, in 1985 in Katowice, Poland, in 1988 in Fredericton, Canada, in 1992 in Hanover, Germany, in 1993 in Banff, Canada, in 1996 in Hong Kong, in 1999 in Olsztyn, Poland, and (the 10th symposium) in Orange, California, in 2001. The published proceedings of those symposia provide an enormous wealth of information on the development of new techniques and new methods in monitoring and analysis of deformations. The next symposium is planned to be held in Greece in 2003. The paper in hand is the result of the studies of the Ad-Hoc Committee 'Classification of Deformation Models and Terminology' of Working Group 6.1 'Deformation Measurements', FIG Commission 6. The Ad-Hoc Committee was set to work due to a recommendation of the chair-man of FIG-Working Group 6.1 on the occasion of the 6th International FIG-Symposium on De-formation Measurements in Hannover in 1992. Earlier reports were given on the 7th International FIG-Symposium on Deformation Measurements in Banff, Canada in 1993, on the Perelmuter Workshop on Dynamic Deformation Models in Haifa, Israel in 1994, and in 1996 at the 8th International FIG-Symposium on Deformation Measurements in Hong Kong. A summary of the studies was presented at the 9th FIG-Symposium on Deformation Measurements in Olsztyn, Poland in 1999. The closing session of this symposium was devoted to a comprehensive discussion on the topic. It was concluded by the chairman of Working Group 6.1 summarizing the activities concerning the methods and models of deformation analysis during the past two decades. The paper here as submitted to the 10th FIG International Symposium on Deformation Measurements in Orange, California in 2001 is the official final report of the Ad-Hoc Committee and includes the proposals discussed in Olsztyn. A summary of the studies can be described as follows: The deformation of an object is the result of a process. The today's techniques offer the possibilities to measure and analyze such a process in all details. This is in accordance with the current trends in engineering surveying which intend to determine not only the geometrical changes of an object in a phenomenological manner but rather the dynamics of the process, i.e. the investigations aim at incorporating the causative forces and the physical properties of the body. In its entirety, the body, the causative forces and the resulting deformations are considered a dynamic system. Consequently, the most general and comprehensive models are dynamic models, from which - by simplification - static, kinematic and congruence models are derived. The simplified models offer the possibility of meeting many practical aspects of deformation analysis which do not necessarily require the complete investigation of the process in all details. As a result it can be stated that in our days 'geodetic deformation analysis' means 'geodetic analysis of dynamic processes'. The tools to do so, are made available by disciplines like e.g. the sciences of civil engineering, mechanics, filter and control engineering, signal analysis, and system theory. Especially system theory provides an established terminology and classification of models for an up-to-date deformation analysis in the above sense and in accordance with the latest trends of engineering surveying. Deformation analysis should be considered an interdisciplinary concern to the benefit of all sciences involved. In the late 1970s and early 1980s, Working Group 6.1 of FIG concentrated their efforts on the development of new monitoring techniques and on the geometrical analysis of frequently ob-served geodetic deformation networks, continuous measuring techniques were just at the beginning. This state is reflected e.g. in the content of the papers presented at the 1st FIG-Symposium on Deformation Measurements in Krakow (1975). At that time, the main problem of the deformation analysis was the identification of unstable reference points in geodetic monitoring networks. Several approaches were proposed by different authors. As a result, an Ad-Hoc Committee on Deformation Analysis was established at the 2nd Symposium in Bonn (1978) with the task of comparing different approaches and developing a unified theory for the geometrical analysis of deformation surveys. Several research centers joined the work of the committee, with the most active centers being from universities of Karlsruhe, Hannover, Stuttgart, and Munich in Germany, universities of New Brunswick in Canada, and Delft in the Netherlands. The work of the Committee was summarized at the XVI. FIG-Congress in Montreux (Chrzanowski et al. 1981), at the 3rd Symposium on Deformation Measurements in Budapest (Heck et al. 1982), at the XVII. FIG-Congress in Sofia (Chrzanowski and Secord 1983), and at the XVIII. FIG-Congress in Toronto (Chrzanowski and Chen 1986). Parallel to the work of the Ad-Hoc Committee on Deformation Analysis, several researchers especially at the universities in Stuttgart (Felgendreher 1981, 1982), Hannover (Boljen 1983, 1984), in Fredericton (Chrzanowski et al. 1982; Chen 1983; Chrzanowski et al. 1986; Chen and Chrzanowski 1986), in Calgary (Teskey 1986, 1988), and in Munich (Ellmer 1987; Kersting 1992) initiated work on expanding the deformation analysis into the physical interpretation and modeling of the relationship between causative factors (loads) and the resulting deformations. Some authors began already to take advantage of the increasing importance of automated measuring techniques (e.g. Pelzer 1977a, 1977b, 1978). The work of these researchers was fundamental for the development of geodetic deformation analysis to a deeper and wider understanding of deformation phenomena which are basically the result of dynamic processes. It was understood that deformation analysis has basically to be seen from an interdisciplinary point of view. Consequently the field of geodetic deformation analysis expanded, e.g. into civil engineering and geotechnical applications. The more geodesists and engineering surveyors went into the analysis of dynamic processes, the more confusing were the technical terms they were applying to their studies. The terminology which could have been used was well established in physics and mechanics and in other sciences a long time before geodetic engineers became involved in the physical interpretation of deformation. In 1992, at the 6th FIG-Symposium in Hannover, some papers made the confusion obvious: e.g. the purely geometrical analysis of deformation measurements was called 'static' by some authors, or the time dependent geometrical analysis was named 'dynamic', particularly when dealing with cyclically changeable deformations etc. The main confusion arose from the fact that it was not distinguished between modeling the geometrical (descriptive) comparison and the load-deformation relationship of the observed deformation. Thus, as a result (Chrzanowski 1992) an-other Ad-Hoc Committee was created in Hannover to look into the terminology and classification of deformation models with a focus on dynamic models. The original Ad-Hoc Committee consisted of professors Milev (Bulgaria), Pfeufer (Germany), Proszynski (Poland), Steinberg (Israel), Teskey (Canada), and Welsch (Germany). They presented two progress reports (Ad-Hoc Committee 1993, 1994) at the 7th FIG-Symposium in Banff in 1993 and at the Perelmuter Workshop on Dynamic Deformation Models in Haifa in 1994. After that, some members of the committee lost their interest in the work of the committee and the commit-tee disintegrated. Nevertheless, Welsch (1996) gave a status report on the proposed terminology at the 8th FIG symposium in Hong Kong taking into account the latest trends and developments from system theory and signal processing (e.g. Heunecke 1995). A summary of the ongoing studies was then presented at the 9th FIG-Symposium on Deformation Measurements in Olsztyn, Poland (Welsch and Heunecke 1999). The closing session of this symposium was devoted to a comprehensive discussion on the topic. It was concluded by the chairman of Working Group 6.1 summarizing the activities concerning the methods and models of deformation analysis during the past two decades (Chrzanowski 1999). The following paper as submitted to the 10th FIG International Symposium on Deformation Measurements in Orange, California in 2001 is the official final report of the Ad-Hoc Committee and includes the proposals discussed in Olsztyn. Some examples of practical applications illustrate the state of the art of geodetic deformation analysis. They make obvious how the various disciplines involved can derive benefits from the interdisciplinary aspects of deformation analysis. Summarizing, it can be said, that the traditional task of deformation measurements has been the investigation of movements and displacements of an object with respect to space and time. Driven by the development of measuring and analysis techniques and the need of interdisciplinary approaches for solutions, the goal of geodetic deformation analysis is nowadays to proceed from a merely phenomenological description of the deformations of an object to the analysis of the process which caused the deformations, i.e. to incorporate the causative forces and the physical properties of the body under investigation. In its entirety, the body, the influencing forces and the resulting deformations are considered a dynamic system. Thus 'Geodetic Deformation Analysis' means 'Geodetic Analysis of Dynamic Processes' with the consequence that engineering surveying has to understand to a certain degree the dynamics of the processes the object monitored is involved in. Consequently, the most general and comprehensive models are dynamic models, from which - by simplification - static, kinematic and congruence models are derived. The simplified models offer the possibility of meeting many practical aspects of deformation analysis which do not necessarily require the complete investigation of the process in all details. In many practical applications simply the graphical and numerical representation of recorded geodetic measurements without any further modeling is regarded as sufficient. Economic aspects of almost every surveillance with respect to potential risks and hazards are essential, extravagant expenses are generally avoided, and individual solutions with appropriate models are usually requested. However, the scenario is to be seen as a whole; each discipline has to contribute its specific knowledge and expertise in quantifying and analyzing the respective process. In any case, the surveying engineer is forced to talk to his colleagues of neighboring disciplines like civil engineering, mechanics, geotechniques, filter and control engineering, signal analysis and system theory, to understand their technical language and thinking and to make them acquainted with his own expertise and technical language. Ideally the terminology applied should be standardized and be understood by everyone involved. Hopefully, all disciplines involved will eventually speak the same language. They have to interact and to complement each other, albeit their specific measuring and analysis techniques may remain different. Before entering the discussion on models and terminology some brief statements on the main tasks of deformation measurements are advisable. 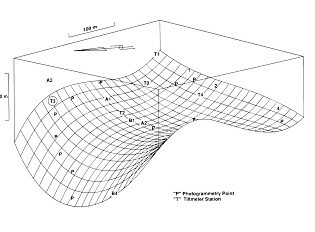 Engineering surveys are involved in all phases of the lifetime of a construction (Fig. 1). With respect to this report, deformation measurements during the operation and utilization phase are of special interest. The essential task of deformation measurements and their analysis during this phase is a comprehensive and pertinent description of the state of an object under investigation. Other geodetic contributions to the quality circle will not be discussed. An explicit distinction between man-made structures and natural objects like landslides etc. is not necessary just as the latest developments of the various measurement techniques are not subject of the following considerations. Aim and purpose of any surveillance is the earliest possible detection of a damage, failure or an injury to the safe operation of a construction in order to be able to react appropriately and in time. 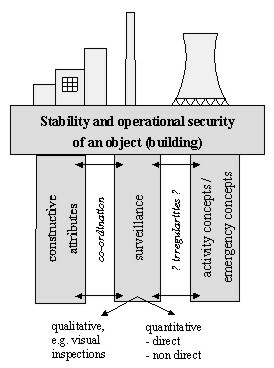 However, surveillance is only one of the columns of the stability and operational security of a construction, which has to be seen in a holistic way (Fig. 2). Usually the construction itself is the most important column. The activity and emergency concepts include but are not limited to aspects of normative and budgetary constraints; integrity, material and structure damage assessment; intensified surveillance and diagnostic technologies; lifetime and utilization evaluation; maintenance and repair, out-of-service and replacement decisions etc. The worldwide immense number of in-service structures requires more and more investments in these concepts. In Ger-many for instance, these investments equal the capital expenditure for new buildings in the very near future (SFB 477-2000). Under these circumstances it is quite clear that surveillance and analysis techniques gain more and more significance. Fig. 3 shows the result of a study in Japan which analyzes the time elapsed between the completion of highway and railway bridges and the detection of a damage. The study makes evident that the knowledge of the integrity of in-service structures on a continuous time basis is an ultimate objective for owners and maintenance authorities (Bergmeister 2000). It is self-evident that engineering surveying cannot cover all aspects but is capable of providing essential contributions. It has to cooperate and communicate with other fields of engineering. A common basis for communication is being provided and already applied by system theory. The surveillance of an object involved in a deformation process requires the object as well as the process to be modeled. Conventionally, geodetic modeling the object (and its surrounding) means dissecting the continuum by discrete points in such a way that the points characterize the object, and that the movements of the points represent the movements and distortions of the object. This means that (only) the geometry of the object is modeled. Furthermore, modeling the deformation process means conventionally to observe (by geodetic means) the characteristic points in certain time intervals in order to monitor properly the temporal course of the movements. This means that (only) the temporal aspect of the process is modeled. This kind of modeling and monitoring an object under deformation in space and time has been the traditional geodetic procedure (Fig. 4). (It is not the scope of this report to discuss the methods of the various other disciplines dealing with the measurement of geometrical object changes. Their proceedings fit more or less the scheme of Fig. 4.) Consequently, the deformations of an object are described solely in a phenomenological manner. For the analysis in space and time there are in principle two classes of models. Models testing the identity or congruence of the geometrical properties of an object at two (or more) points of time are referred to as models of congruence. They regard the time factor only implicitly. Models de-scribing the deformation on the basis of a given or assumed function of time, i.e. velocity, acceleration etc., are called kinematic. Practically, the classical deformation analysis consists in a purely geometrical comparison of the state of an object (represented by its characteristic points) at two different points of time. The model for the analysis of the observations does not consider the time intervals between the observations nor the factors responsible for the deformation - explicitly. Implicitly, however, some knowledge and information about the presumable behavior of the object and the deformations in space and time have to flow into a proper set-up of the deformation monitoring project. (Pelzer 1971). Basically the inherent differential equation is tested. The global test detects whether there are any significant coordinate differences. If there are any, then the next step is to localize the point(s) which are causative. If need be, the movements of point clusters can be generalized by rigid block movement or strain analysis, or in terms of other systematic patterns. This kind of deformation analysis is traditionally referred to as (conventional) deformation analysis, the resulting point movement pattern as deformation model. Since this ‘geometrical’ deformation analysis (Chrzanowski et al. 1990) is based on the hypothesis (1) of identical point coordinates, the deformation model is to be called identity or congruence model (e.g. Welsch et al. 2000, pp. 369-418). When automated measurement procedures came into use, the temporal course of deformation processes was more and more considered in evaluation models (e.g. Pelzer 1977b). If these models are restricted to the investigation and description of object movements and distortions in space and time, one speaks of kinematic models which have offered the opportunity to extend the classical purely geometrical deformation analysis in congruence models. The intention of kinematic models is to find a suitable description of point movements by time functions without regarding the potential relationship to causative forces. Polynomial approaches, especially velocities and accelerations, and harmonic functions are commonly applied. This system represents in general the set-up of a regression analysis. 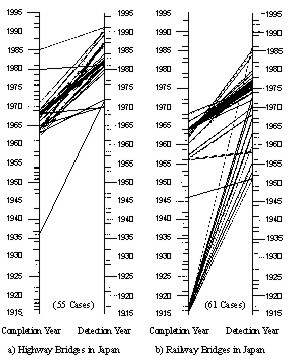 In expansion of the basic regression analysis sequential adjustment algorithms are an important mathematical tool which are in a formal manner a transition to Kalman-filtering techniques, and are suitable to make use of consecutive observations for updating and predicting the state of a process under investigation (Pelzer 1987; Welsch et al. 2000, pp. 419-446). Advanced evaluation models for deformation analysis do not only consider the change of the geometry of an object in space and time. They rather investigate and incorporate also the influencing factors (causative forces, internal and external loads) causing the deformation. They regard in addition the object's physical properties (material constants, extension coefficients, etc.) which are characteristic and responsible for the response of the object to the acting forces. The three elements 'acting forces' as input signal, 'transmission through the object' as transfer process, and 'response of the object' as output signal form a causal chain or - according to the terminology of system theory - a dynamic process or a dynamic system (Fig. 5). b) static systems can be seen as a special case of dynamic systems. They react immediately (without a memory) to the change of the causative forces: the new state is a state of equilibrium. The deformations are a function of changed loads only. d) random walk systems are in motion, but the motion is random, a function of time cannot be established apriori. Modeling a dynamic process according to Fig. 5 is by far more comprehensive than modeling solely the deformation as the reaction of the object in space and time. The complexity of dynamic modeling makes the requirement of interdisciplinary cooperation obvious. 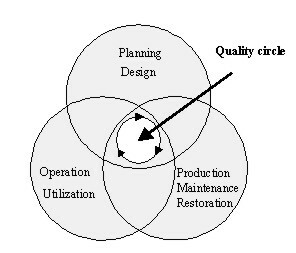 To set an example, the technical system 'construction' (Fig. 6) is stressed by internal and external forces or loads (like traffic load, wind pressure, backwater pressure, temperature etc.). These so-called input quantities (input signal) have to be determined by measurements. The reaction of the system is deformations (e.g. rigid body movements, strain). In order to model (calculate, predict) the reaction of the system as the output signal, the transmission through the object (transfer function) has to be modeled as well. Parameters to do this are in particular the construction's geometry, its material parameters and the assumed material behavior. If the two elements - input signal and transfer function - are known, the dynamic process can be modeled and the reaction can quantitatively be predicted (if need be by the aid of the Finite Element Method or another computation tool). This kind of a dynamic model is also referred to as a deterministic (Chrzanowski et al. 1990), mechanical or computational model. Consequently, error propagation should be taken into consideration (e.g. Kuang 1993; Szostak-Chrzanowski et al. 1994; DIN 1319-1997). If, how-ever, in addition also the reaction of the system, i.e. the deformations, is determined by (geodetic) measurements, the full potentiality of dynamic models becomes obvious (integrated models). The comparison of the predicted to the observed deformations may reveal some deviations which are called 'innovation' (Fig. 10). The innovation is the basic element for KALMAN-filtering techniques. Fig. 6 accentuates the components of the investigation and the assessment of a process: modeling the process (theory), performing the measurement of input and output quantities, evaluating functional and stochastic relationships, and - finally - assessing the findings by verification and validation. In this way the model can be calibrated and the dynamic process be identified. Worldwide numerous research centers are active to adapt and to apply this general interdisciplinary scenario. Descriptive models like the congruence and kinematic models are already described in par. 3. The class of cause-response models are the ones to be characterized in the following in more details. For many applications in our days the understanding of engineering surveying intends - as out-lined above - to consider not only the space and time domains of deformations, but rather the whole chain of a dynamic process, i.e. to incorporate also the causative forces acting on the object and the geometrical and physical properties of the object itself. With today's technology the basic requirements thereto are available: the possibility of measuring and recording the input and output signals of a dynamic process are in the same way at hand as the computer capacities are sufficient to perform the necessary algorithmic calculations. As practice shows, in many instances the main difficulty is the availability of appropriate software programs to process the data accordingly. 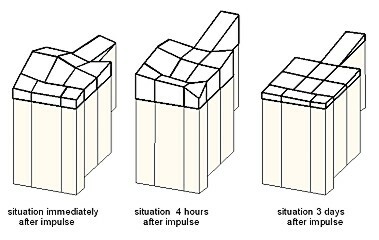 Static models describe the functional relationship between stress and strain. Stress is caused by loads or the forces acting on the object and resulting in strain as the object's geometrical reaction. Since the factor time is not explicitly considered in static models, the object has to be sufficiently in equilibrium in both the observation epochs, i.e. before and after the load has been brought up on the object. Sufficiently in equilibrium means, the object has to appear (more or less) motion-less during the time of observation. The movements and distortions of the object are considered a function of only the load but not the time. For static models, the physical and geometrical structure, the material parameters and other characteristic quantities of the object have to be known and to be formulated in terms of differential equations expressing the stress-strain relationship of the object. 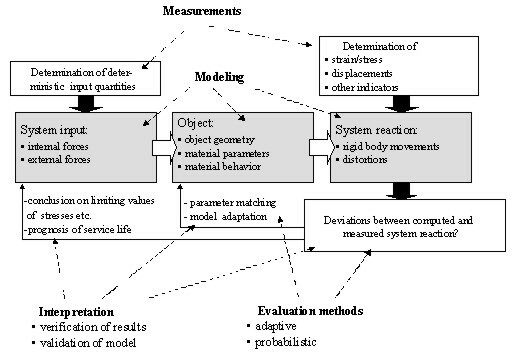 This requirement leads to another term of characterization of static models: static models are parametric (see below), structured or deterministic models. Other terms are state or theoretical models; the evaluation applying static models is also called 'model approach'. Static models are frequently applied, if the load-carrying capacity of structures like bridges, pylons etc. is to be tested. An example is given in par. 6.2. Dynamic models are the most general and comprehensive models because they aim to describe the reality of dynamic systems completely. The movements and distortions of the object are considered a function of both load and time. This implies time varying stresses and time varying re-actions. In contrast to the static situation the object is permanently in motion. Monitoring such a situation requires permanent and automatic observation procedures. Dynamic models can be parametric or non-parametric (see below). Other terms for non-parametric models are attitude or statistical, experimental or empirical models; the evaluation applying non-parametric models is also called 'operational approach'. So far, there are hardly any parametric dynamic models being used for the geodetic analysis of dynamic processes, at least not for the so-called multiple input - multiple output (MIMO) situations. Almost all dynamic models applied to deformation analysis are non-parametric. In Fig. 8 the four categories of deformation models are characterized by their capacity of taking the factors 'time' and 'load' into account. In system theory, the set-up of an appropriate mathematical-physical representation of the transfer function of a dynamic system is called system identification. System identification can be achieved, if the input as well as the output signals are available as measured quantities. The feasibility of how a model for the transfer function can be set up, is decisive for the choice of a parametric or a non-parametric identification (e.g. Heunecke et al. 1998, Heunecke and Welsch 2000), see Fig. 9. If the physical relationship between input and output signals, i.e. the transmission or transfer process of the signals through the object or - in other words - the transformation of the input to out-put signals, is supposed to be known and can be described by differential equations, then the model is called a parametric model (structural model). The system identification is carried out in a so-called 'white box' model. Of course, white box models are - as it is the case with all models - an idealization of the real world. y(t) is the system input, the acting forces which have, if need be, to be complemented by the disturbance noise; x(t) and its derivatives are the system output (to be monitored e.g. by geodetic means); the matrices K, D, and M contain - in case of an application of mechanics like a building or another construction - material and design parameters for rigidity, damping and mass. Depending on the actual problem individual sets of parameters or measurements can be inapplicable. For instance, for the investigation of characteristic oscillations the damping matrix is to be omitted, and with slow motions the mass can be neglected (Heunecke 1995, Jaeger et al. 1997). is applicable. Static systems are characterized by capturing a new state of equilibrium after assuming a load with y(t) = const. is of special interest. It comprises the models of identity and congruency, i.e. the most common application of deformation monitoring based on geodetic networks; see par. 3. In the context of structural models it is of importance, that coordinate systems are introduced as reference systems. Coordinates are intermediate quantities of the evaluation procedure. They are called state parameters comprised in the state vector. Apart from coordinates also additional (physical) state parameters may be used. In the sense of system theory state parameters serve for the description of the inherent relations of the system; they form the state space. The investigation of a dynamic process with the help of a structural model is based on the analysis of the state space. If with parametric system identification only the time dependence rather than the local variation of the process is considered, the system can be defined by 'lumped parameters'. Ordinary differential equations are sufficient in this case. If with parametric system identification apart from the time dependence also the local variation of the parameters is considered, the system has to be defined by 'distributed parameters'. This leads to partial differential equations. If the differential equations are set up for restricted areas only, the partial differential equations can be replaced by ordinary differential equations which are, however, effective only within these limited areas (local discretisation). The solutions found for the individual areas have to be joined to each other taking into account boundary conditions for a smooth connection. The result represents an approximate solution of the original differential equation. A numerical procedure is given by the Finite Element Method (FEM) which is today the standard computation method for any kind of structural problems in civil engineering and in many other engineering sciences. KALMAN-filtering is the most popular and universal estimation tool for system identification and can be applied to all kinds of models in Fig. 7 and 8, resp. (Welsch et al. 2000, pp. 285-317). The essential idea can be explained as follows. On the one side there is the theory modeling the object by differential equations. These equations form the so-called system equation. On the other side there are measurements monitoring the real behavior of the object. The measurements are formulated as the so-called observation equation. KALMAN-filtering is a technique to combine both equations by least squares adjustment in order to gradually improve the identification of the sys-tem. For this the innovation, i.e. the difference between the predicted and the measured reaction of the object, is essential. The algorithm can be used whenever a system equation can be established. In a congruence model the system equation degenerates to the prognosis of identical coordinates; deterministic input quantities uk are not modeled. For a kinematic approach the state vector contains coordinates, velocities and accelerations. Kalman-filtering in deformation analysis is mainly applied to static or dynamic models with system equations set up by the Finite Element Method, see par. 6.2. If there is no way of modeling the geometrical and the physical structure of a system, the relationship between input and output signals can be formulated only in the sense of regression and/or correlation analysis (behavior model). Time series analysis is helpful. System identification means then the determination (estimation) of the regression/correlation coefficients. Commonly these coefficients or kernels are called parameters, too, although they are not the physical parameters of the process under investigation; they relate rather the input signals to the output signals without any physical significance. These non-parametric models are therefore also called ‘black box’ models. It means that system identification is based on measurements only but not on a mechanical model; it is symptom but not model orientated. The unknown coefficients ak and bk are the parameters to be estimated in the identification procedure. The boundary values q and p represent the continuance of the memory: at time tk the model recollects all the input and output events back to those boundaries. Characteristic for this elementary non-parametric model is the fact, that for q > 3 and p > 0 a physically meaningful model structure gets lost, although the coefficients have to be regarded as functions of the material and design parameters of the system. For q £ 3 and p = 0, however, the parameters can physically be interpreted. In other cases the model is a ‘gray box’. However, the distinction between the different kinds of models – white, gray and black – is gradual, and depends on the appreciation of terms like ‘parameter’ or ‘physical structure’. For p = 0 the model is autoregressive: the actual observation xk is considered a linear combination of the past observations and the present system input yk. For q = 0 the model becomes non-recursive: the actual system output is a linear combination of the present and the past system inputs. The coefficients bj can then be regarded as the factors of a regression analysis. where is the so-called weight function which plays - as above - the role of regression analysis parameters. In the discrete case these models can be written in form of a summation or multiple summation equation, resp. (Pfeufer 1990, 1993). Non-parametric models can be applied to a great variety of systems and processes. Time series analysis (Welsch et al. 2000, pp. 319-367) as such is another method of system identification and is frequently applied in non-parametric situations. The most significant information to be calculated in the time domain of a time series is its expectation value and the auto-covariance function which informs of variance of the process observed. Comparing the input and the output time series by calculating the cross-covariance function, one obtains information about the correlation of the two time series and whether the reaction of the system is delayed with respect to the input signal (phase shift). If one applies Fourier-transformations to switch from the time to the frequency domain, characteristic frequencies of the process can be detected. The output signal comprises only frequencies which are also contained in the input signal. Consequently, frequencies which are in the output but not in the input signal, can give clues that there may be more than the investigated factors influencing the system. Time series analysis as such has a wide range of applications in geodetic deformation analysis (e.g. Kuhlmann 1996). Recently new analysis techniques have been adopted from control engineering: neural networks and fuzzy logic have been used to set up models for the identification of input-output systems (Heine 1999). In practice, a comprehensive and complete analysis of a deformation process can hardly be carried out applying only one kind of the above mentioned models. In almost all instances, experiments have to be made to find the best method and procedure, even 'trial and error' should not be excluded. This is especially relevant, if the geometrical and/or physical model to be chosen is not clear but questionable so that the problem of model separability arises (Lu 1987, Chen and Chrzanowski 1994). This point, however, is not specified further on in detail. A practical approach may be the following: According to Chrzanowski et al. 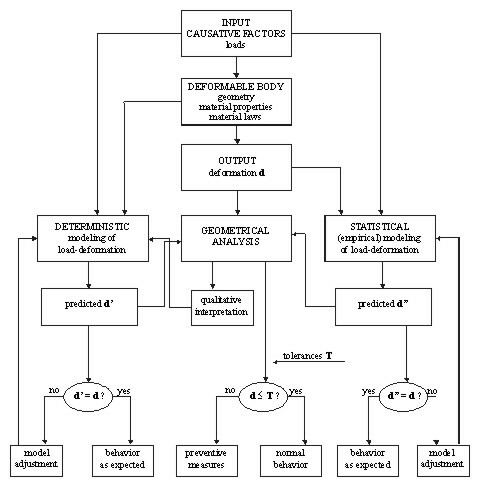 (1990) the integrated analysis of deformation surveys includes the geometrical analysis of the status of the deformable body and the physical interpretation, i.e. the identification of the dynamic process. Fig. 11 shows an idealized flowchart of the integrated deformation analysis. 'Integrated' means the combination of the geometrical analysis with prediction models. The latter can be achieved by applying either the 'statistical', i.e. the non-parametric, or the 'deterministic', i.e. the parametric, method. Once the load-deformation relationship is established, the results may be used for the development of prediction models. Through the comparison of predicted deformations with the results of the geometrical analysis of the actual deformations, i.e. the innovation, a better understanding of the mechanism of the dynamic system is possible. The new knowledge can be used in 'model adjustments' the results of which lead iteratively to what has been referred to (Fig. 6) as parameter matching and model adaptation. A typical example for the application of parametric modeling of a dynamic system is load trials on constructions. The static behavior of a 10.0 m x 2.0 m shell structure, made of bricks, was investigated (Hesse et al. 2000). The semilateral surface loading (1.0 kN/m², loading step No. 6) of the structure and the settlements predicted using FEM is shown in Fig. 12. The surface loading was stepwise increased from zero up to 4.0 kN/m2 (loading step No. 24). The envisaged break-down of the structure could, however, not be achieved. For two of the monitored points (No. 13 and No. 33) the predicted settlements (ANSYS, system equation) and the displacements measured by means of leveling and extensometers (observation equation) are depicted in Fig. 13. The discrepancy between the prediction and the measurements, in terms of KALMAN-filtering the 'innovation', is quite striking. After adaptive KALMAN-filtering the innovation is reduced so that the predicted and filtered settlements are in accordance with the measured values (Fig. 14), there is no significant difference anymore. Adaptive filtering means to identify, i.e. to estimate the material parameters (Young's modulus) of the structure as additional unknown state parameters (state vector augmentation). As a result, the material parameters (physical state quantities) obtain values which differ quite a bit from the original assumptions. Based on the results of the parametric identification, the assessment of the stability and the operational security of the structure is now much more realistic and reliable then it was before. The following example discusses the reaction of the foundation pillars of a large turbo engine due to temperature variations (Ellmer 1987). Due to irregularities and major gaps during the data acquisition of the temperature and deformation measurements, in a first step interpolation and approximation procedures were applied to the time series in order to achieve equispaced data which are required for the analysis models. 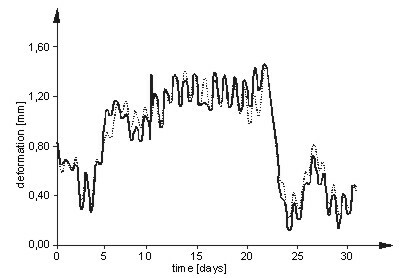 In a second step Fourier transformations were used to get preliminary information on the behavior of the system. The last step relates the temperature changes to the deformations by a SISO identification model which considers the fact that temperature changes effect the foundation pillars over a longer period of time. This model is given by equation (13) which is restricted, however, to the estimation of the non-recursive parameters b0, ... , bp only, where p stands for the memory-length. The solution includes p = 30 significant parameters bk. This model is able to demonstrate that most of the deformations can be explained by the recorded temperature variations (Fig. 15). Fig. 16 depicts the reaction of all the pillars of the turbine table to an input impulse of 1 K immediately after the impulse, after 4 hours and after 3 days. The point of this sort of non-parametric system identification is that the model describes the reaction of the object to be monitored in a 'black box' manner. It is meaningful, because it relates input signals (temperature variations as physical causative forces) to output information (deformations of the pillars). It does not contain, however, any information about the structure or at least the significant material parameters, e.g. the coefficient of expansion, of the system which could make evident why the system reacts as it obviously does. The physical interpretation of dynamic processes on the basis of non-parametric models is therefore always limited; the interpretation is symptom oriented. Another typical application of deformation analysis is ground subsidence. The Sparwood coal fields, British Columbia, for instance were observed and analyzed by Chrzanowski et al. (1990). The purpose of the surveys was to monitor ground movements caused by the extraction of a 200 m by 700 m panel of a 12 m thick and steeply inclined coal seam (Fig. 17). Three types of monitoring observations were used under rough climate conditions: tacheometric geodetic measurements, aerial photogrammetric surveys and continuous measurements of changes of ground tilts by automated biaxial tiltmeters. 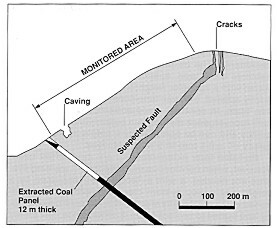 Between 1980 and 1982 the panel extraction (input quantity) produced displacements of up to 2.5 m with surface cavings near the coal outcrop and cracks at the mountain ridge. The best fit model of the displacement field of the complicated deformation pat-tern (Fig. 18) was obtained by applying the combined analysis of all three types of observations (Chrzanowski et al., 1986). The analysis led to a suspicion that there was either a geological fault or a discontinuity in the rock mass was created by the progressing mining activity. The phenomenon as a whole could not be readily explained. 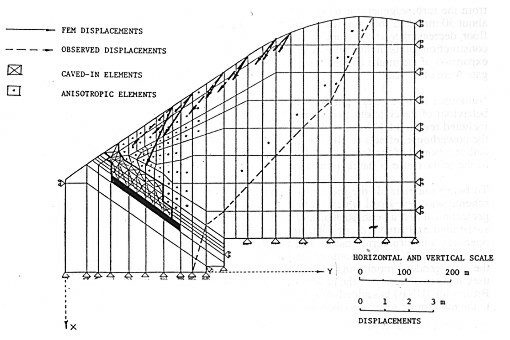 Therefore, a deterministic FE modeling of the subsidence was performed (Chrzanowski and Szostak-Chrzanowski 1986). The modeling was difficult due to the fact that besides the unknown fault parameters also the values of the in situ Young's modulus of the rock were not well known. However, using the results of the geometrical analysis, the deterministic model could be calibrated (adaptation of Young's modulus, insertion of the assumed fault parameters into the analysis). Two FE models were analyzed: one without the assumed discontinuity and one with the insertion of the suspected fault. The FEM results with the fault gave incomparable better agreement with the observed values of the displacements. The final result obtained from this static model is shown in Fig. 19. The findings of the integrated analysis led to the closing of the mining operation to prevent a potential slope failure. The example demonstrates that parametric description, i.e. deterministic modeling, of geological phenomena, though difficult to perform, may lead to useful physical interpretation of deformations if properly combined (calibrated) with the geometrical model. Apart from parameter matching according to Fig. 6 also the identification of the unknown structural properties as for instance the fault zone geometry is crucial for an appropriate solution. comprehensive interpretation of the results achieved due to the knowledge of identifiable and physically well-founded parameters of the process. In many cases there exists only poor knowledge of the internal and external connections of a process. Therefore a universal, generally accepted single scheme for the investigation of different objects cannot be set up. The numerous classes of dynamic models as discussed in this report offer, however, a great variety of possibilities for a pertinent treatment of a great number of processes and objects. The development in this domain has been pushed forward considerably in the previous years, and will be advanced in the future. System analysis (direct problem) requires the input quantities and the transfer function to be known. The reaction of the system is in this case the unknown quantity. At last, the identification problem derives the transfer function from observed input and output signals. The following general problems can be treated and solved for with the help of dynamic modeling (Fig. 20). In case of the direct or design problem, the system behavior (transfer function) is regarded to be known, so that the output signal can be computed (predicted). The inverse problem (back analysis, reverse engineering) assumes the reaction and the transfer function as given and analyses the causative factors (e.g. Kersting 1992). From the geodetic point of view a contribution can be given to system identification by verifying the system's behavior on the basis of input and output signals to be measured. Transitions between the three general problems are fluent. System identification is performed to determine the physical status of a deformable body, the state of internal stresses and, generally, the load-deformation or stress-strain relationship. Once this relationship is established, the results (system equation) may be used for the development of a prediction model. Through the comparison of predicted deformations with the result of the geodetic analysis of the actual deformations (observation equation), a better understanding of the mechanism of the deformations is achieved. Thus, engineering surveying may significantly con-tribute to a realistic interpretation of a dynamic process under investigation. On the other hand, the prediction models which, in most cases, are developed by other specialists, supply important information to the surveying engineer about the deformations to be expected, facilitating the design of the monitoring scheme as well as the selection of the deformation analysis model in the geometrical realm. Unfortunately, in many cases this scenario of a truly interdisciplinary approach to the design and analysis of deformation surveys has not yet been implemented in practice. The reasons are an inadequate understanding of the methods of system identification by surveying engineers, and an inadequate familiarization of other specialists with the comparatively new methods of advanced geodetic analysis of dynamic processes. The gain of knowledge to be achieved by the combination of techniques developed in system theory like KALMAN-filtering with techniques applied in civil engineering like FEM and engineering surveying, e.g. statistical testing procedures and reliability considerations, offers new aspects for the future. Within the last few years, one can see some progress in the right direction, not only within the geodetic community, with more scientific papers on the identification of dynamic systems presented at surveying and geodetic meetings, but in the meantime also at conferences of other disciplines. However, these developments must be intensified. The trend will be supported and enhanced by a commonly acknowledged terminology. The potentiality of all the possibilities of analyzing dynamic systems by appropriate models and methods - from geometrical descriptions to highly sophisticated integrated models and analysis techniques - has to be exploited.